As the industry seeks to extend its ability to develop marginal offshore oil reserves profitably, fields requiring gas lift to generate sufficient oil production often pose a sizable challenge. Gas lift in subsea wells, using injected gas from surface, requires extensive infrastructure – the cost of which can render a marginal field uneconomic to develop. A strong need exists for technology and process solutions that can substantially lower the cost of developing marginal offshore oil reserves under these circumstances. Working with a large offshore operator in the North Sea, Schlumberger has developed and successfully implemented the One Trip Natural Gas Lift solution for intelligent completions. The system uses gas from an available gas zone to create lift for the well. Adhering to the customer’s tight four-month schedule to develop the upper completions for four subsea wells in a North Sea field, Schlumberger developed, tested and delivered an engineered solution combining three completion technologies into a process requiring a single run instead of three separate ones. Minimized risk of formation damage to the gas cap through greatly reducing the exposure period of open gas cap perforations. Enhanced rig safety through reducing well control risks related to open gas cap exposure. Improved environmental protection through eliminating the need to place a kill pill in the gas cap, along with the disposal issues. Rig time reduction of two days, savings in completion hardware and kill pill elimination resulting in savings of $2.8 million. The success of the effort has led this client to incorporate the solution on several additional ongoing projects in the North Sea. The solution has the potential for considerably wider application, aided by its demonstrated compliance with strict North Sea regulations. The operator is among the largest offshore exploration and production companies in the world, with sizable operations in the North Sea; additional production in Russia, Canada and Africa; and further oil and gas activities in the Gulf of Mexico and the Middle East. The field contains estimated commercially recoverable reserves of about 100M barrels of oil and 3.5BCM of gas. The plan was to develop the field with four subsea production wells, using gas cap gas to kick off the wells and enhance the oil production. The operator received government development approval for the field in the first quarter of 2001. While the operator had used natural gas lift extensively in another North Sea field, this new development was a marginal field requiring innovative solutions in the completion design and installation process to achieve sufficient cost reductions. Meeting these project objectives would establish a model for developing other low-volume reservoirs in the area. Perforate the gas cap with tubing-conveyed perforating (TCP) guns. Run sand screens on an intermediate string. Run the wireline-retrievable hydraulic flow-control (WRFC-H [mark of Schlumberger]) valve with the production packer and tubing to surface. Not only was this expensive, it left the gas cap perforations open for an extended period, risking formation damage to the gas cap and posing well-control safety concerns. The technical challenge at hand was to reduce the number of upper completion installation runs to a single trip. Among the needs were to design an environmentally friendly system that could be installed efficiently and safely, with the downhole equipment fully functional during installation. In addition, there was a rapid timetable for delivering the four WRFC-H/screen assemblies and two perforating assemblies required on the first well. With the go-ahead coming in August and delivery set for November 2002, this left less than four months to design, manufacture and qualify the technology. To meet the technical challenges posed by the client’s field objective, Schlumberger designed a method integrating flow control, sand control and perforating technologies into the One Trip Natural Gas Lift solution. While the customer’s present need was for a system to be installed inside 10-inch diameter casing, the 9-inch diameter design adopted could accommodate not only the immediate need but anticipated future applications in the smaller casing size, without further modifications. For flow control, a modified WRFC-H valve allows coupling of the gas inlet to the sand screens. The use of Computational Fluid Dynamics (CFD) modelling of the valve insert for the new inlet design ensures that the gas flow rate can be optimised through the selection of various choke settings, which in turn enables optimum oil production. For sand control, the premium sand screen has an eccentric configuration to complement the offset design of the WRFC-H. 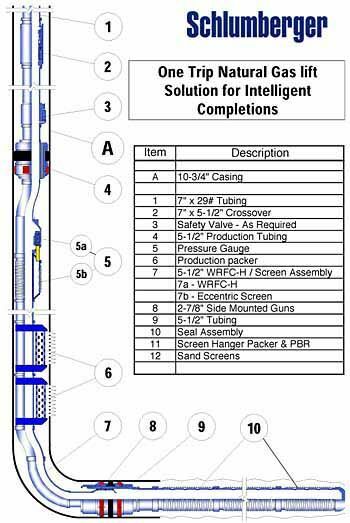 The system design includes solid base pipe with an annular flow area, closed ends and a flow port to the WRFCH. For perforating, the system uses side-mounted TCP guns deployed on the production tubing with the guns oriented away from the tubing. To provide maximum perforation tunnel depth, the system employs PowerJet (mark of Schlumberger) technology and incorporates optimised gun size to suit the completion. The guns have dual redundant firing heads and are pressure activated. 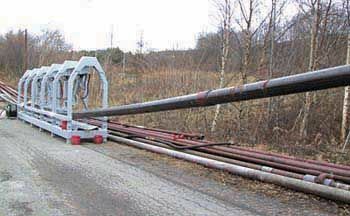 A key feature of the installation procedure is a process design in which firing the side- mounted guns and setting the packer requires simply the manipulation of annular and tubing pressure and the WRFC-H valve. At the same time, and likewise important, the procedure fully allows for contingency measures. The One Trip Natural Gas Lift solution is also advantageous environmentally, as it eliminates the need to place a kill pill over the gas cap perforations and subsequently deal with the disposal issues. From start to finish the customer was closely involved with all aspects of developing the One Trip Natural Gas Lift solution, including specifying equipment requirements and reviewing design. Biweekly teleconference meetings assured continued, close collaboration between the customer and the Schlumberger team, comprising personnel based in the host country and the Well Completions & Productivity engineering centre. The value of that collaboration was evident, for example, in the choke design process. Schlumberger CFD flow modeling to analyze choke sizes and flow characteristics of the design modification relied on client reservoir calculations to position the valve correctly in relation to the gas cap perforations and define the choke sizing. The customer witnessed primary testing of the first systems delivered, as well as final assembly and qualification testing of the WRFC-H / sand screen assemblies and additional testing of those and the sidemounted gun assemblies to assure their functionality at an anticipated maximum well dogleg severity of 15°/100 feet. Delivery of all four systems proceeded in a timely manner, with installation taking place in the first quarter of 2003. During installation, all perforating and flow control valve operations took place without incident. The wells remained shut in until the completion of the subsea hookup in the third quarter of 2003. During cleanup, the customer brought all wells on stream as required, with the WRFC-H gas lift valves performing as expected – delivering optimum production – and safe operations maintained throughout the process. The ability to perform the upper completions with only a minimal period of open gas cap perforation exposure, and without the use and disposal of a kill pill, reduced the risk of formation damage while enhancing the safety of the installation process and protection of the environment. With the One Trip Natural Gas Lift solution applied in all four production wells in this field development, the client achieved savings of $2.8 million in rig time, completion hardware and the eliminated expense of a kill pill, when compared with similar conventional completions in a nearby field that it likewise operates. Looking ahead, the One Trip Natural Gas Lift solution could have substantial application in the development of marginal offshore oil reserves. Already, this customer has chosen the same technology, with specific custom variations, for use in three ongoing North Sea field developments, with the relevant completions slated for implementation during the third and fourth quarters of this year. Schlumberger has also received a number of inquiries about the One Trip solution from other operators worldwide, its proven performance in meeting tough North Sea standards helping to pique their interest.